The Torah is the first five books of the Jewish and Christian Scriptures and is foundational to the faith of both. It is hand-written in Hebrew consonants by scribes observing traditions passed down for thousands of years. Dr. Scott Carroll, the scholar working with the Larsons, observed that the rules of the writing process have fixed the text of the Torah. The Torah scroll donated by the Larsons consists of 50 calf skins that were made into parchment and sewn together. If unrolled entirely it would be 80 feet long. Most of the skins have five columns of text, but not all the skins are the same width. Some of the skins have holes and other minor defects outside the writing area. Some holes are covered with sewn patches. Some loose seams have been re-sewn by a conservator. The text has about 860 noted corrections, most being corrections to the form of letters. Special formats of spacing in the text are evident which indicate important passages, such as the Ten Commandments, the song of Moses, and the priestly blessing. Each of the books ends exactly four lines short of the full 51 lines of the previous full columns, an amazing feat of scribal planning. Now Regent faculty and students, especially those studying Biblical Hebrew, can study and read from a unique and inspiring primary source with a rich history. 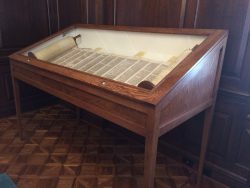 The scroll is being stored in a specially designed case in Library Special Collections. Persons desiring to see it should contact by email the Special Collections Supervisor, Donald Gantz (donagan@regent.edu). 2 Adam E. Berkowitz, “Yemen Arrests Jew for Smuggling Ancient Torah to Israel,” Breaking Israel News, March 25, 2016, https://www.breakingisraelnews.com/64353/yemen-arrests-jew-for-smuggling-ancient-torah-to-israel-jewish-world/. This entry was posted in News Features and tagged archives, Hebrew, scroll, special collections, Torak, Yemen on April 6, 2016 by Harold Henkel.